Happy new year, everyone! We hope you enjoy having New Year's Day off, because January 2 is going to be the start of another challenging year for the food & beverage industry. In many ways, there's more optimism and fewer impediments than we've seen in the past couple of economically challenged years. But 2013 brings a new set of challenges, some the result of a return to growth – plus some perennial ones. 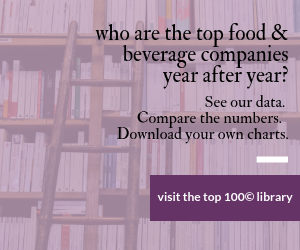 Late last year, we surveyed our editorial advisory board and some other trusted confidantes and consultants in the food & beverage industry to come up with a list of top issues for the new year. We boiled those suggestions down to the following five, although we're sure you have plenty more to worry about. While that's a handy and recognizable acronym for genetically modified organisms, better terms are genetically modified food or genetically engineered food or ingredients. The subject is either the logical evolution of food science or the beginning of "frankenfood" – sorry, but you know that's how at least some consumers are viewing this development. Early in 2012, we attended the Natural Product Expo in Anaheim, Calif., where guys were running around in hazmat suits to protest GMOs and petitions were circulating to get the FDA to require labeling of such ingredients. While this is a biased crowd, this is no fringe, table-top show. The 32-year-old show set records, with more than 60,000 attendees and some 2,000 exhibiting companies filling more than 1 million net sq. ft. of space. Only 18,000 attended the Institute of Food Technologists' annual Food Expo last year. The year nearly ended with the November 6 general election, which, on the California ballot, included Proposition 37, an initiative requiring the labeling of foods and beverages sold in that state that carried genetically modified ingredients. Loud and public outcries by its supporters were met with a lower-key and highly localized information campaign by its detractors. Organic food processors were in the former camp, traditional/nonorganic processors and farmers and big agribusiness in the latter. With as many farmers as consumer activists in California, the proposition failed, although narrowly. "This defeat has done little to slow down anti-GMO activists and the resulting pressures faced by food companies," says David Ter Molen, an attorney at the Chicago law firm Freeborn & Peters LLP. "2013 will see trends continue from last year on this hot-button topic and the rise of some new issues, including: calls for federal and state-level labeling of GMOs, boycotts and on-line protests based on demands for food ‘transparency,' lawsuits targeting ‘all natural' food products that include GMOs and the growth of products verified as non-GMO." Grain crops. Sanderson said he's looking hopefully to South American crops, which were being planted on schedule, and ultimately a successful harvest to offset some of the shortages of the U.S. crop due to this past summer's drought. The gridlock in Washington. Although speaking before the avoidance of the fiscal cliff, he noted, "We recall the significant negative impact the contentious debate regarding the debt ceiling had on American consumers in August of 2011, and we hope that is not repeated." 2013 crop plantings. "American farmers have very incentive to plant corn and soybeans on every available acre, and we believe they will." The development of 2013 crops. "[Even] a normal trend line yield on corn acres will go a long way… A bin-busting year, of course, would be a bonus." The European financial situation. "While it doesn't impact us directly, serious problems with the European economies or a European bank crisis could spill over on our shores and dampen our recovery." By the way, Mr. Ter Molen will be contributing a guest column next month on the subject. There are plans for similar ballot initiatives in Washington, Connecticut and Vermont, and consumer groups are lobbying the FDA and even the president to weigh in. The year ended with the first media look at the long-rumored bioengineered salmon, "genetically altered by scientists who made it grow bigger and grow faster than ever before," as ABC News put it. "Behind padlocked gates and barbed wire fences in Panama grows what could be a landmark change in what we eat." The company, Aquabounty, took an Atlantic salmon, a favorite species for diners, and added genes from a Chinook salmon and sea eel, both faster-growing species, to create a patented fish that grows to market size a full year ahead of plain Atlantic salmon. The company is awaiting FDA approval to sell and license its technology to fish farmers. What it really comes down to is a pursuit perhaps as old as history itself: trying to understand our food and where it comes from. There's only one (each) Eric Schlosser and Morgan Spurlock; there are million of mothers who just want to responsibly feed their children. By the way, we will devote our April Wellness Foods cover story to a discussion of GMOs. Defining "natural" is about as difficult as defining "good." That may be most of the reason the FDA has never created a legal definition, even though the agency successfully outlined organic. "Natural" concerns come in many forms. People worry if the growth hormones in milk are pushing their daughters into early puberty; that the antibiotics in their beef make them susceptible to an antibiotic-resistant superbug; or the synthetic ("artificial") colors in so many food & beverage products are causing autism. What about pesticides in your vegetables? Is high-fructose corn syrup natural? Even how humanely your Kentucky Fried Chicken was raised could be in some consumers' definitions of "natural." Somewhere in the middle was the summer of 2012 dust-up over lean finely textured beef (LFTB). Sorry, but we can't help but make a quick reference to its ABC News-created pejorative "pink slime." Beef Products Inc., which perfected the process of turning trimmings into lean hamburger, nearly went bankrupt when TV chef Jamie Oliver and ABC News questioned the ground beef and especially the ammonium hydroxide antimicrobial treatment it receives. Ammonium hydroxide is USDA approved and generally recognized as safe. But applying a term that sounds like ammonia to food for school children, well, it just didn't sit well. FDA has never issued a regulation covering natural claims, but it has adopted an informal policy that defines "natural" as meaning "nothing artificial or synthetic, including all color additives regardless of source, has been included in, or has been added to, a food that would not normally be expected to be in the food." Even without a regulatory definition, "natural" is always among the top-used label claims, according to several new product-watching organizations. Lately, lawsuits against processors who allegedly misuse the term are getting to be just as numerous. Something's got to give. Read our Power Lunch guest column on p.11. We've written about frivolous class-action lawsuits before, but Thomas Hanrahan, an attorney with Sidley Austin LLP, notes that lawyers who made their fortunes suing tobacco companies have set their sights on the food industry. While every food company had to deal with the recession one way or another, now that it's over a new emphasis on profitability and repositioning is emerging. Companies that survived by being reactive are now expected to be proactive. While there's always been a "circle of life" in this business, last year witnessed some of the most cataclysmic changes in recent memory. Venerable Kraft Foods split itself in two, its high-growth, mostly acquired, mostly international snack food businesses (Nabisco, Cadbury, Jacobs-Suchard) becoming Mondelez International, while its grocery store staples (Kraft mac and cheese, Maxwell House coffee, Oscar Mayer meats) remain part of Kraft Foods Group. Sara Lee now is just a brand of renamed Hillshire Brands, with the mostly coffee, mostly European businesses becoming D.E Master Blenders. Ralcorp began 2012 by spinning off its Post Cereals business and ended the year being acquired by ConAgra Foods. Dean Foods will spin off to shareholders its WhiteWave-Alpro segment, which makes soy milk, and is selling its Morningstar division, which makes extended shelf-life products, to Canadian dairy Saputo. There are rumors Dole is considering some kind of split. And Hostess Brands is out of business, although its iconic brands and products (Twinkies, Wonder Bread, Donettes) soon will be bought up by competitors. Despite the end of the recession, "There's no doubt the bar has been raised again regarding costs," says Dexter Manning, national food & beverage industry leader for accounting and consulting firm Grant Thornton LLP. Input costs, especially commodities, are going up, as are regulatory costs. "Very few companies are not going to be impacted by the new Affordable (Health) Care Act," he says. "It's not just about operating efficiencies anymore. It's getting harder and harder to improve margins. And with a lot of uncertainties on the cost side, companies feel they need to do something proactive before all this hits." It sounds like post-recession hunkering down. "They're looking for a synergistic strategy," Manning continues. "They're asking, ‘What's our core? What's our value?' They're looking to focus on making more money from their core business." Another factor is that credit remains cheap and now is becoming a little easier to come by. One measure is all the banking and financial advertisers we've carried in Food Processing recently: GE Capital, Lazard Middle Market Financial Services, PNC Bank, US Bank. They're all saying to food & beverage processors: There's money available if you want it. Private label creep or brand resurgence? ConAgra unequivocally answered the question posed in that subhead. "Clearly, consumer dynamics have changed since the recession and we expect growth in private label food to continue to outpace growth in branded food," Gary Rodkin, ConAgra's CEO, said in announcing his company's late-November deal to acquire Ralcorp. But if private label is such a pot of gold, why didn't Ralcorp acquire ConAgra? Even as the category leader in private label, Ralcorp wasn't exactly awash in cash. In its fiscal 2012, which ended Sept. 30, 2012, the company earned a scant $73 million on sales of more than $4 billion. The prior year it lost $187 million. TreeHouse Foods, the No. 2 private labeler and our 2010 Processor of the Year, earned $94 million in 2011 on sales of more than $2 billion. Margins are slim in the private label business, and profits in effect are shared with the store for which you're producing the product. Nevertheless, "Private label got a toe-hold during the recession and will only increase in market share now that new consumers have tried those products," says Manning. "There's still a lot of uncertainty out there, a lot of financial pressure on consumers. If they can buy a comparable item for less, they will." One respondent to our Manufacturing Survey (p.51) asked in an open-ended question about business concerns: "Will the consumer maintain the same high taste standards or will they lower them because of economic times?" Remains to be seen. Branded products will succeed when they offer additional benefits or a clear differentiation from a private label counterpart, he says. A good reason to continue to fund your R&D department. This is no trend, but it always has, always will be, an important goal for the food & beverage industry. Food can impart health, and it can damage health. Doing more of the former and less of the latter is the golden rule. Obesity is still public enemy No. 1. Our country seems to have evolved from ignorance of the connection between food and obesity, first to a recognition that personal responsibility is the solution to, now, a feeling that it's the food industry's responsibility to solve that problem for America. The latest wrinkle in that last philosophy is regulation. Tougher restrictions on advertising to children, more scrutiny of health-imparting claims and maybe even taxation – as with cigarettes and alcohol -- as a way to separate people and food. New York City's Health Dept., at the behest of Mayor Michael Bloomberg, last September approved a ban on the sale of full-calorie drinks in more than 16-oz. cups or bottles. The law, which still is being disputed, should take effect March 12. That came after that city's ban on trans fats and the requirement that restaurants list the calories of their menu items and – so far – before any limitations on salt and sodium. On that last issue, the mayor and the health dept. have been clamoring for some kind of mandated salt reductions. And from the greater state of New York, State Assemblyman Felix Ortiz twice has proposed taxes on junk food (in 2003 and 2011), both unsuccessful (so far). In October 2011, Denmark introduced a "fat tax" -- on butter, milk, cheese, pizza, meat, oil and processed foods that contain more than 2.3 percent saturated fat. One year later, the Danish Tax Ministry abolished the tax, stating that it failed to change Danes' eating habits and created its own problems. "We can't tax our way to healthier lifestyles, and we need to make that clear to our members of Congress," says promotional material of American Against Food Taxes (www.nofoodtaxes.com). "After all, we do have an obligation to our children - and to ourselves - to promote healthy lifestyles through balanced diet and exercise." On the other hand, foods and beverages can impart health. Every food processor worth its salt (pun) is working on making products healthier. Nestlé SA, which calls itself "the world's leading nutrition, health and wellness company" (note the lack of the word "food") has staked the company's future on healthy eating. In addition to improving foods throughout its portfolio and adding nutraceuticals, Nestle last year acquired Pfizer Inc.'s nutrition business for $11.85 billion. This article originally appeared in the January 2013 issue of Food Processing Magazine.